You know the face. You know the credit list: Lost in Space, Escape from the Planet of the Apes, Gunsmoke, Bonanza, Kung Fu, The Twilight Zone and hundreds more... 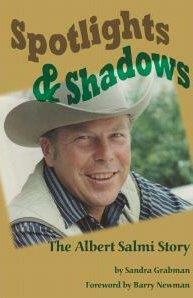 But who was Albert Salmi? Born of Finnish parents in the Finnish section of Brooklyn, Albert Salmi had a childhood he would recall fondly, even though it was plagued by the hardships of the Great Depression. In an attempt to earn money as a teenager, he broke the law; and the very wise judge gave him a sentence that turned his life around. Salmi set his sights for an acting career and, thanks to the GI Bill, got the best training possible. The result was that for forty years he appeared on the Broadway stage (Bus Stop, etc. ), national television (Alfred Hitchcock Presents, I Spy, That Girl, Dallas, etc., etc. ), and in countless films (The Unforgiven, Caddyshack, etc.). Sandra Grabman's biography is a frank and loving tribute, combined with many memories from Salmi's family, friends, and co-stars, and includes never-before-published memoirs from the man himself. From humble beginnings -- to a highly successful acting career -- to a tragic death that shocked the world -- Albert Salmi's story is unlike any other you'll ever read. albertsalmi.com Value: $25.